Choosing the right boots for your hunting dog can be as challenging as purchasing your own shoes. Dog boots are used to care for your dog’s paws from rocks, sand burns, ice, and another rough terrain. It can as well be used to protect the pooch injured or sore paws of your dog. Just like human hunting boots, there are a few things to consider before bringing out your purse. 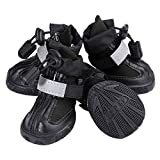 It is necessary to know what make and material your dog boots need to be, and what you will require, in addition to the boots for them to safely and comfortably fit your puppy. Maybe you have returned from a hunt to discover that your dog paws are red, bloody or maybe injured. It is not an unusual occurrence; so that is the reason hunting dog boots are not so popular. 1 Why Does Dog Need Boots on Hard surfaces? Why Does Dog Need Boots on Hard surfaces? While walking on hard surfaces can strengthen paw pads, it can as well increase the risk of arthritis, especially if you constantly run your dog on concrete or asphalt. However, it is a rocky mountain that can tear up your pup’s paws the most, and no amount of asphalt running can prepare your dog for that. Dogs paw pads are naturally strong and are built to run on all types of terrain. However, dog paws are far from invulnerable and some pooches have paw pads that are more sensitive than others. Maybe you probably have several hunting dogs and never once even think of buying a pair of hunting dog boots. And then, you acquire a puppy that changes everything and suddenly you are strapping small boots on your pup. Hunting dogs are so dedicated to their work so much that they will often work through great pain without showing much pain. Some dogs really need hunting dog boots or some sort of paw protection. It is not wimpy; rather it is more about maintaining an alpha position. One important thing to note about hunting dog boots is that the boots are comfortable and lightweight enough to enable the dog to do their work without any problem. Heavy or bulky boots can cause your dog to have funny steps, slow down or try to get them off at every other stop. Be sure to measure your dog’s paws and read the fitting guidelines provided by the producer. If your dog’s hunting boots do not fit well, it is very likely that your dog will throw boots while hunting. Misfit boots can also produce irritation and blister-like sores. Hunting dog boots can keep your dog safe in many different locations and guarantee you do not end up with a dog that needs veterinary care because of the foot injury. When shopping for hunting dog boots for your dogs, you will discover that you have many choices. Usually, you will find boots that are simple and designed for lightweight use, and you will also find boots that are made to be durable for heavy use. It is up to you to decide what type of dog boots will be suitable for your dog. And as a dog owner, you want to do everything possible to ensure your dog is safe. Heavy-duty hunting dog boots are produced for active dogs. If your dog goes hiking, hunting, or is frequently exposed to adverse weather conditions or terrain, then heavy duty boots are the right choice. 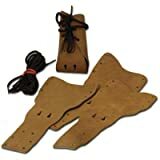 These hunting boots are usually produced with a durable sole and solid materials. They are water-resistant and are designed to provide good traction power on any surface. These boots are perfect in environments with rocks and plenty of dangers that could hurt your dog’s paws. The boots will also protect your dogs against frostbite, hot pavement, and chemicals. Heavy boots will provide the best protection in any condition. A lot of people choose to wear their dogs light boots because they are usually cheaper than heavy boots. And lightweight boots are also fashionable. They usually come in trendy designs and are decorated to be attractive. Heavy duty boots are more functional and focus on durability than the design. They can come in different designs, but the design options are generally limited. All hunting dogs can make use of dog boots. They are not just for a spoiled dog that needs shoes to fit their new clothes or for adventures pooch that hikes the mountains. Any dog that goes outside can benefit from the protection provided by the dog boots. Now let me showcase the 5 hunting dog boots picked by our customers. Bark Brite All Weather Neoprene Paw Protector Dog Boots in 5 Sizes! (XL (4.0 in.)) Travel Zipper Case Included! Now let’s review the individual product and its features. While dog boots can improve the comfort and overall performance of your dog, some dogs do not like to wear shoes. In this case, the following are some of the best hunting dog boots you can get to protect your dog’s paws. This hunting dog boots are excellent for protecting the soft pads from snowy ground, keeping your house clean even after walking your dog in rainy climates and muddy terrain. It eases hook and loop fasteners belts keep the boots on through all the actions, and the Reflective lines enhance visibility all the night. Expandable, most comfortable for put in, take off the furry legs. 1 pack consist of 4-Pcs, and these booties are available in different sizes. This is among the best brand in the pet industry, just like the brand name; Hardworking with a Happy ending. These boots are specially designed for hiking and other outdoor activities. These moderate height dog boots with thicker vamp and sole, extra durable and difficult to unglued. The design opening is at the back ankle, adjusted by a long Velcro strap. Booties are made up of high-quality material to protect the dog paws. Most comfortable, flexible, waterproof with the smoother soft sole. Have an adjustable strap, and one of these is best dog boots that stay on without second thought. It protects the dog paws even on hard stones, smooth floors, grasses when going for hunting. These booties can be used for dog hunting, hiking and best suitable for ranging from small, medium, large dogs. Comb your dog hair with these brushes. If you enjoy exercising or adventuring with your dogs, especially in harsh climate conditions, you need to purchase sporty dog boots for paw protection. PetFavorites dog boots are ideal for use on your dogs when running, swimming, cycling hunting and walking, skying, or just walking outside. The soft velvet lining with adjustable bootlaces keeps your dog paw warm, dry, and comfortable, strong and nonslip flexible rubber Protection against hot road surfaces or snowy terrain. 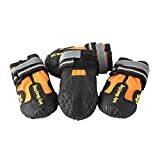 Best non-slippy dog booties for the puppies. 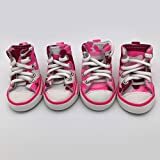 These sporty shoes are available in 8 dog paw sizes. This dog booties are specially designed for hunting, walking, hiking. Bootes are more adorable and protect the dog paws in every season. Caution: Before purchasing make sure to refer size chart. These boots protect the dog paws against the uneven terrain, It prevents thorns and other things from getting stuck over your dog’s paws. It allows your dog to walk through the hot asphalt without any problems. Keep in mind that it only has to be 80 degrees outside for concrete and asphalt surfaces to reach three digits high enough to burn the bottom of the paw pads. It helps provide additional support for dogs suffering from joint diseases such as arthritis. with Two Reflective Fastening Straps and Rugged Anti-Slip Soles: These hunting dog boots are perfect for Small-Medium, and Large Dogs. These all-weather pup boots come with a reflective Velcro strap and are produced to fit the natural shape of your dog’s paws. To also support the fitting of the boat, they come in five different sizes according to the measurements of your dog’s paws. In addition, the interior lined help control the temperature and non-slip sole helps your pooch’s trek across all types of terrain. Best suitable shoes ranging from small, medium to large dogs. High-quality rugged booties can resist winter, summer seasons. These are best suitable for hunting dogs, and can easily accommodate snow, winter months. Protect dog paws from hot pavement. High customer satisfaction hunting booties. 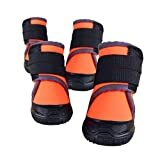 This set of flexible dog boots will serve as a good companion for them, protecting their paws against hurt from asphalt, grass, and sidewalks, etc. The sole of these dog boots is flexible, sturdy and non-slip and allow the boots to be used both outdoors and indoors, in dry or wet, cold or hot conditions. They are strong enough to withstand the outside play, protect the pup’s paws from dirt, rocks, and mud. With a wide split seam top opening, it makes it very easy and quick to put the dog boot on. These paw protectors are hand washable, lightweight, and non-slippy. Durable, supportive in every season, and best suitable for daily walking. Paw protectors are made-up of high-quality material and waterproof sturdy soles. These are the best winter dog booties that stay on and durable. Booties available in different sizes, choose the best fit for your dogs, puppies. These dog booties come with Zipper Drawstring Water Resistant for outdoor running. It’s durable, water-resistant, flexible, non-slip and allows the shoes to be used indoors or outdoors, in wet, dry, cold and hot conditions. The rugged anti-slip sole provides stability for dogs on the tiles, hardwood floors and sand. It also protects the paws from hot pavement and sharp thorns. No more sandy paws or wiping muddy after snow or rain. It made of PU leather and Elastic Neoprene Waterproof Material. Stretchable, Soft, breathable, it can also be used outdoors or indoors or, in wet and dry situations. Best paw protectors from hot pavement and durable in nature. 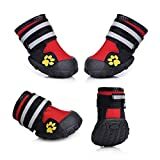 These dog shoes can be used indoor, outdoor in winter, summer seasons. It has made-up of quality material and can be stretchable for ease of use. Shoes available for small to large dogs in 10 different sizes. Zipper design makes your furry feel comfortable. the bootlaces work well and are long enough to wrap around the pups ankle to secure the boots. The dog toenails do not always stay in small openings, but still, fit in fine if not unstable slightly if she runs. I highly recommend these boots to anyone looking for comfortable protection without any plastic. The manufacturer of this product appreciates the quality craftsmanship of the artisanal quality of the products. They only use the best leather and other materials, giving the customers the best possible service and the best quality products. Best leather, handcrafted booties for the dogs. Suitable for all kinds of paw sizes. Shoes are made of leather and other quality material to produce the best in class products. These are the best leather hunting dog boots. These boots are ideal for all weather conditions and indoor and outdoor activities, such as hiking, running, hunting and other moderate offers. Great shoes for water and rainy days! One stop best hunting shoes for all weather conditions and can use indoor, outdoor activities. Keep the dog paws clean from snow, hard, rock surfaces. Booties are available for small, large, XL, XXL paw sizes. High customer satisfaction and designed for dog safety. These are the best dog boots for hunting, share your comments, thoughts on dog shoes, and let us know which one is making more feeling comfortable for your dogs. Excellent collection of dog hunting booties.